The North Eastern Region of India comprises of Assam, Meghalaya, Manipur, Arunachal Pradesh, Mizoram, Nagaland Tripura and Sikkim. Located in the eastern most corner of India, the region is home to different indeginious communities reflecting diversity in lifestyles and social customs. The North Eastern Region comprises of about India's 8% land area and around 3% of the population of the country. Of the 6 international borders that India shares with its neighbours, the North Eastern Region shares borders with all except Pakistan. The North Eastern Region is cradled by the 5 Asian states namely- Nepal , Bhutan, China, Bangladesh and Myanmar. The North Eastern Region of India lies in the convergence point between SAARC and ASEAN. That is, where SAARC ends, ASEAN begins, and therefore the strategic and topographic importance of the region are significant. The North Eastern Region of India is known for its huge reserviors of rich natural resources as region is endowed with diverse biodiversity, fossil fuel, coal limestone, forest resuorces with exceptional variety of flora and fauna. The North Eastern Region encompasses 30% of India's flora and more than 30% of the total water wealth of the country. North East India is characterised by social, cultural, political, geographical and historical diversities. These diversities resulted in lack of integration and accumulation both intra regionwise and inter regionwise. Just like any other region or province of the country, North-East too was predominantly an agriculture based societywith few home based small industries like weaving, metal works, craftsmanship.The British annexed the North Eastern Region relatively very late and that too in a phased manner with least interference in socio-economic and cultural lives of the tribals who again varied culturally and linguistically distinctly. They were only interested in plantations, chiefly tea, forest products like precious timber, minerals and crude oil. The first oil refinery of the country was set up at Digboi, Assam to exploit the rich oil reserves of the North Eastern Region. The British did very little to improve the socio-economic conditions of North East. The British government, thus, did nothing much to contribute to the economic development of the region. The Mughals too could not impact this region as they failed in all their attempts to annexe this region, hold on to it and establish their rule, thereby, failing to link the north eastern region to the main heartland of their empire. Lack of physical infrastructure, intra territorial conflicts, ethnic unrest and insurgency has prevented both public and private investsments to take place, thus easing the scenario of backwardness to continue. Politically, the portion of the country on the eastern front and the eventual neglect of the North Eastern Region of India by the subsequent governments and some of its detrimental policies has deprived NER of its natural markets. Winds of liberalisation that started flowing across the country in 1991 also could not benefit north east due to the same mentioned reasons. However, of late it appears that efforts are being made to integrate the North eastern region with the Indian mainland and also there has been much talk about the potential of the North eastern region in contributing immensely to India's Look East Policy due to its geographical proximity to East and South east Asia. Initiated in 1991, India's Look East Policy marked a strategic shift in India's perspective of the world. It is not merely an external economic policy, it is also a strategic shift in india's vision of the world india's place in the evolving global economy.This Look East Policy, which has been upgraded to the Act East Policy in 2014, serves as a platform for deepening and strengtening its relationship with ASEAN and the East Asian economies. This policy can cause immense developmental benefits to the hitherto backward North East region. It can get India recognition as a regional power, it can act as a counterweight to China's imperialistic and hegemonic designs. It will further strenthen India's claims to the UN Security Council's membership. It will counter china's encircling of india through its Maritime Silk Route and the One Belt One Road initiative. The Act East Policy when acted upon has to have its centre of activity in the North Easten Region only. This economic hub will cater to and impact more than 40% of the global population. North east India will not just be an economic centre or trade junction between India, China, Nepal, Bhutan, Bangladesh and ASEAN countries but also has the potential to generate additional revenue by exporting power to its ower starved neighbours, given its tremendous hydroelectric potential. While 75% of the hydro potential of the country is claimed to come from the himalayan river system-indus-Ganga-Brahmaputra, more than 50% of the same comes from Brahmaputra and its tributaries. Therefore it goes without saying that North Eastern Region is India's future energy storehouse- that too clean and environment friendly energy.In this context, it is useful to mention that the centre has identified the ecologically fragile Arunachal Pradesh as the powerhouse of the country. According to an estimate of the Central Electricity Authority (CEA) and private power developers, this state bordering China has the potential to generate over 57000 MW of hydropower. A big consolation for the North Eastern Region in the backdrop of its backwardness is that its Human Development indicators have been consistently high on an average. The region has also done well in the social sector and more so in the spread of literacy. Female literacy especially has done quite well compared to national averages. Hardly there is any other region in India which is more suited to achieve economic growth and sustainability as the North Eastern Region. Bamboo not only has cultural significance in india in general and north east specially, but it is also the highest yielding renewable natural resource. Bamboo as a traded commodity has an excellent potential to contribute to inclusive development and sustainability, the major consumers being paper and pulp industry and the construction sector. Although india possess 45% of global bamboo growth, its share in global bamboo trade and growth is less than 5%. Bamboo, called 'green gold', is essentially a type of grass. But its classification as a tree for 90 years prevented the north east, which grows 67% of india's bamboo from exploiting it commercially, unlike China, the only country with richer bamboo genetic resources.The allocation of Rs.1290 crore for a restructured National Bamboo Mission in the recent budget has raised hopes for a range of bamboo based industries from food processing to construction. The present govt's slogan- "Sab ka saath, Sab ka vikaas", has affirmed its commitment to develop the North Eastern Region which has remained alienated from the mainland due to various historical, political, cultural and geographical reasons. It is further heartening to notice that the North eastern states have satrted to appreciate the commitments and initiatives of the centre. 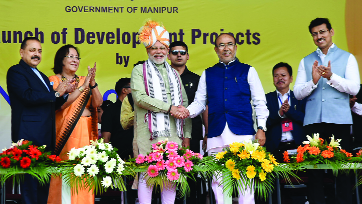 The recent election results in Tripura and Meghalaya, and the not very recent election results in Assam and Manipur could be deemed as North Eastern Region's approval of the centre's development agenda. North Eastern Region is equally potential in terms of viability and suitability, if not more, for industries like ITES, tea based ind, food processing ind, crude oil and natural gas, petrochemical based ind, agro and forest, textile and handicrafts industries. All these being labour intensive industries will finally generate employment. CII in a convention for enterpreneurs held in Guwahati, Assam, stated that -" There is little time to be lost considering the huge pool of natural resources and the quality of Human Resources, North east of India has the potential of being an important investment destination and centre for trade and business. Also very recently, the ADVANTAGE-ASSAM- global investors summit 2018 also held in Guwahati, aimed at highlighting the geo-strategic advantages offered to the investors in Assam. Throughout the summit, the Prime Minister emphasized that India's growth story would be further energised through balanced and fast paced growth of the North Eastern Region. This revolutionary economic development of the North Eastern region is possible only if Act East Policy is acted upon firmly and fast. Our speed must take China for surprise and make every stakeholder country and economic participants watch with awe. Last but not the least, precondition for this to happen is that all must come together by bidding goodbye to triffle issues like territorial disputes, ethnic hatred, insurgency. Our political parties, both regional as well as national, should rise above their petty political and electoral gains and work together towards this noble end.